In Portugal, near empty villages (aldeias) and neighborhoods are not uncommon. Often set amid the wide open countryside, they may seem a bit eerie but there is nothing truly spooky about them. In reality, Portugal’s ghost towns are the result of economic changes and the shift from rural to predominantly urban lifestyles. Here are a few of Portugal’s most curious abandoned locations. If you have ever visited Algarve, it may be hard to imagine an abandoned rural village near to the resorts and beaches, but look a little closer next time. East of Alte (about 20 kilometers north of trendy Albufeira) lies Rocha Amarela (which means ‘yellow rock’), surrounded by seemingly endless natural beauty that includes springs, mountains, and adorable (populated) towns. There isn’t much that’s known about this village but walking through the peaceful streets makes for a welcome break from the usual party scene in Algarve. Plus, the nearby village of Alte is a nice stop after leaving Rocha Amarela, for some traditional Algarve culture. How would you like to buy an entire village near Spain? Apparently, Picões, in the northeast part of Portugal, was for sale. 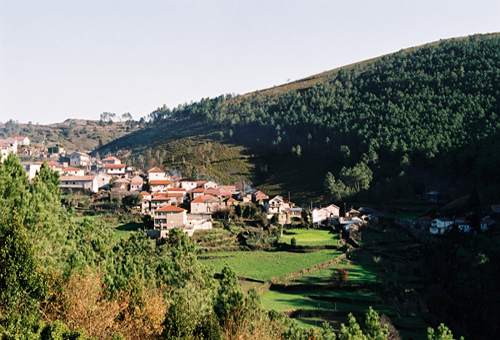 In addition to seeing a completely abandoned village, Picões is a great place to go to immerse yourself in nature, surrounded by wooded and mountainous terrain. Another perk is that after a day of ghost hunting, you can relax over a glass of wine from the Douro Region, at one of the local vineyards or wineries. Another village that has been for sale is Covêlo do Monte in Boticas, which hasn’t had a resident in over 50 years. Filled with stone walls and crumbling stone houses, there doesn’t seem too much that anyone can do in this area other than farming or winemaking, but the decrepit infrastructure is amazing to see. While it’s unclear exactly how old Covêlo do Monte is, it is located in one of the oldest parts of Portugal near Trás-os-Montes. Sticking with the mysterious and ghost-filled themes, after visiting Covêlo do Monte, try a glass if Vinho dos Mortes (Wine of the Dead) which is wine that has been buried underground, after being bottled, for 2 or more years. On the outskirts of the Peneda-Gerês National Park lies a village called Vilarinho das Furnas. The unique aspect to this village, other than being abandoned, is that it spends most of its time submerged under water. In 1972, a local reservoir was filled and Vilarinho das Furnas drowned in the process. This seems to have been a planned event, the last resident had moved out the year before, in 1971. Obviously, being almost completely submerged makes it hard to visit on most days, but the area becomes a popular destination when the water levels drop low enough for the village to peek out. The village is thought to date back to Roman times, due to other infrastructure in the area, and may once have been inhabited by Visigoths, a nomadic German tribe that flourished during the late Roman Empire. As with Algarve, abandoned villages near Lisbon are something many people may not expect, but hop on a train and travel one hour away from the capital and the isolation will soon become apparent. Lived-in since the 9th century, Juromenha may not be completely abandoned today but the numbers are dwindling and a few structures have long since been forgotten, including a 10th-century Arab castle. Like neighboring Spain and nearby France, Portugal is full of towns and villages that are heading towards desertion in the near future. A few villagers still stroll along the streets that they’ve known since birth, and some immigrants return to their homeland to build vacation homes, but mostly, the numbers are declining. Rich in history and natural beauty, they need an opportunity for a second life. Fortunately, some villages get that chance, such as Pedralva in Algarve.